Scott Family Health is your path to good health, giving you the most comprehensive and effective integrated health solutions in Loveland, and Northern Colorado. We’re passionate about helping you achieve holistic health and happiness, which is why we offer a number of different healthcare services to help people improve mobility, reduce pain, defeat stress, and live a happier, healthier life. If you think about it, each and every one of our health services has something uniquely helpful to offer to your body and mind. But what would happen if you combined some of our services throughout your daily life for more brilliant health effects? In this blog, we’re going to discuss the 1-2-3 punch of integrative health solutions at Scott Family Health, and how the positive effects of these solutions can rejuvenate, heal, and energize your health and your life. Chiropractic care with Scott Family Health doesn’t just help treat your pain—it can help you understand what’s causing your pain, and how your pain is manifesting itself in your body. Everyday pain caused by work, exercise, poor posture, and a number of other activities can leave you with lower back and neck pain, and increase the likelihood of improper spinal alignment and other spinal ailments. Luckily, by scheduling a few sessions with Scott Family Health, manual chiropractic adjustments can alleviate aches and pains, promote proper spinal alignment, and increase your mobility and flexibility. But that isn’t all that makes chiropractic care at Scott Family Health so easy and effective. While some chiropractic care centers are extremely vague about the chiropractic process and indifferent about your lifestyle and health problems, our chiropractors will guide you through every step of our chiropractic care, and conduct a thorough examination of current physical state, as well as your past health history. By knowing more about what ails you in the past and the present, we tailor our chiropractic care to your needs for the most effective and helpful results. Although acupuncture has been practiced across the world for over 3,000 years, the popularity of acupuncture has skyrocketed in the past two decades in the United States because of its ability to alleviate a variety of pains and ailments through simple, non-invasive acupuncture sessions. In the simplest terms, acupuncture uses extremely tiny needles inserted into strategic spots of your body to treat pain and reduce tension of muscles and connective tissues. While nobody likes the sound of needles being stuck in their bodies, acupuncture sessions are virtually painless, and the entire process is more relaxing than anything else. Acupuncture doesn’t just treat pain—it can help reduce the effects of allergies as well. Research indicates that frequent acupuncture sessions can curb symptoms of chronic sinusitis, allergic rhinitis, watery eyes, headaches, and hay fever. Within four to six acupuncture sessions, chances are you’ll be feeling much better—and breathing better, too! 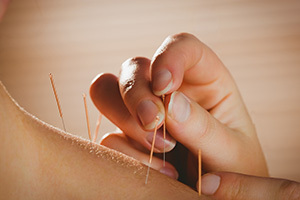 At Scott Family Health, our highly educated and board-certified acupuncturists are knowledgeable and experienced with older, Eastern-style acupuncture methods, as well as newer, Western acupuncture technology and practices, ensuring that you get the best of both worlds when it comes to your acupuncture treatment. Plus, with some of the friendliest service in Northern Colorado, you’ll feel safe and relaxed throughout your session! Massage—it sounds relaxing just saying it. If you’re already feeling happy and healthy from a few chiropractic and acupuncture sessions, then you need a massage to put you in a blissful state of relaxation, well-being, and vitality to top it all off. The benefits of getting a massage (or a series of massages) at Scott Family Health are three-fold. 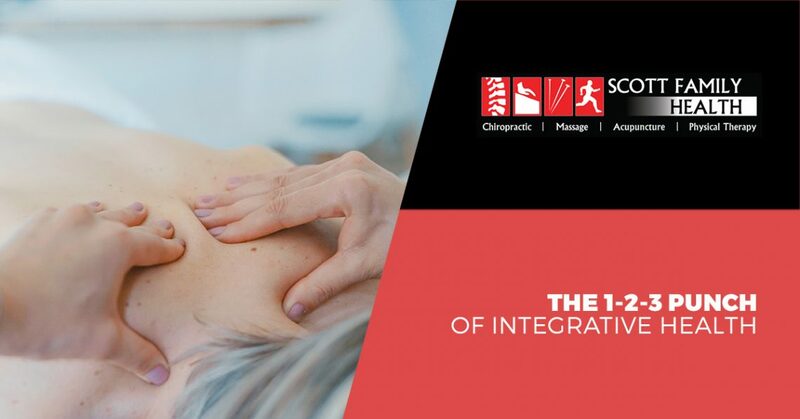 First of all, massages will help alleviate your acute and chronic pains that come from a variety of causes, including car accidents, sports injuries, poor posture, and physical stress from heavy lifting and physical activities. You’ll experience less pain, have more relaxed and functional muscles, and see an increase in your overall mobility and energy (although you’ll feel more relaxed and peaceful than energized right after your massage). Second, a massage will melt away feelings of emotional stress, bring clarity and peace to your mind, and provide you with an overall sense of happiness. Isn’t that why we all love massages? Finally, a massage at Scott Family Health is conducted by one of our friendly and experienced LMTs, who will take your health history and needs into account to give you a massage that’s customized to your body and your health goals. With all of these benefits, why wouldn’t you stop by for 30 minutes or an hour of relief, relaxation, and restoration? For the 1-2-3 punch of integrative health solutions, and overall wellness, choose Scott Family Health. Our Loveland medical center makes it convenient to stop by for any of our services, and our top-notch medical professionals will help you heal what ails you. Schedule an appointment (or three) with us today!